Lime Tree View on Lime Tree Lane (later Lime Tree Road) was a guest house and hydropathic establishment from the mid-nineteenth century, first owned by William Cartledge. The poet and artist "Dante Gabriel Rossetti and Elizabeth Siddall, later his wife, stayed there in 1857". Rossetti, together with Holman Hunt and John Everett Millias, "was a leading spirit in founding the pre-Raphaelite brotherhood". He married Elizabeth Siddall, who "had been a model for a number of paintings including Millais' Ophelia", in 1860. Mr. Cartledge's establishment opened in 1857, so it was new when the Rossetti's stayed there. In 1872, when it was first placed on the market, the stone built property was described as "a large and commodious house and premises, with terrace, lawns, kitchen gardens, stabling and coach-houses". It was suggested that the house "could at little cost be converted to first-class hydropathic establishment". Another advertisement two years later said it had "6 sitting rooms, 2 entrance halls, 14 principal bedrooms, 3 attic bedrooms, 2 kitchens and scullery, 2 pantries and a well-fitted bathroom and outbuildings included a double coach house and stabling for 5 horses". In 1877 Lime Tree View was being enlarged by Messrs C. Allen, B.A. and his brother J. Allen, two schoolteachers who were moving from Sheffield and opening Matlock Bank College. 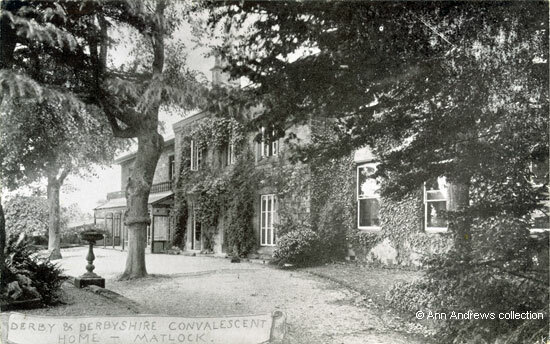 They later moved to Smedley Street, re-naming their school the Cavendish School. The property was purchased in December 1888 for £1,950 for what was to become the Derby & Derbyshire Convalescent Home (pictured above), that was linked to the one already established at Derby for the sick poor. The money to buy it had been raised entirely from donations. The Lime Tree Road property had been chosen because it had to be capable of receiving 35 patients and for its position "situated on Limetree-hill ... about 500 feet above the [river] Derwent". When it was bought there was still a sitting tenant (the school) but they were due to leave on 25th March 1889. A fundraising grand bazaar was held in the Drill Hall in February 1889 and a large sum was raised for the Convalescent Home; this was an event repeated in subsequent years. A Board of Trustees and management and officers were appointed. Advertisements were placed in local papers during February 1889 and Miss Peet was appointed as the matron; Miss Eastland took over later on. The venture was opened by Lady Edward Cavendish in June 1889. Annual meetings were held and in 1900 the board reported extensive repairs to the boundary walls and building as well as redecoration both inside and out. They also tried to help the war effort that year (the Boer War). "In January last, at a special meeting, the Board decided to place ten beds at the disposal of the War office for convalescent soldiers returning from the front, giving the preference to members of the Derbyshire Regiments or men from Derby and the county." By the date of the meeting they had only received one application and he wasn't from Derbyshire! Christmas Day in 1914 saw a continuation of the traditional celebrations when patients, staff, and a number of Belgian refugees, as well as friends of the Home, were entertained by the kindness of committee. "The rooms were tastefully decorated by Mr. W. Daniels, with evergreens, flowers, flags and the colours of the Allies". By 1917 the patients were wounded soldiers who were in Matlock to convalesce. 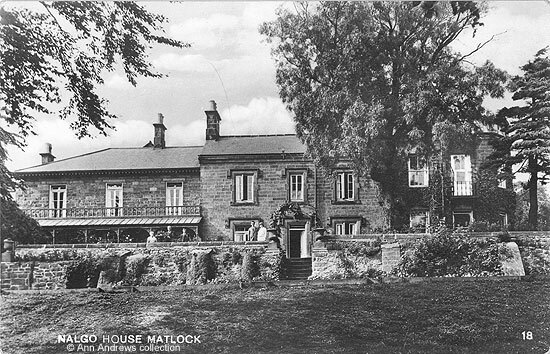 "Among the many institutions which are working hard for the alleviation of sufferings and the restoration to health of our gallant men from the battlefields of France must be included the and Derbyshire Convalescent Home at Matlock. Since June, 1915, over 320 convalescent soldiers have been received and have stayed an average of 39 days each. All left the home greatly benefited and in many cases completely restored to health". The Convalescent Home on Lime Tree Road closed at Christmas, 1921, and the Derby when Derbyshire Association for Convalescents was formed. Two months later, in February 1922, the building was again advertised for sale. The postcard above dates from the days the property was run by NALGO as a Convalescent home for its members. Later in the twentieth century it became The Lindens residential home for the elderly but has been converted into three private homes in recent years. The Derby & Derbyshire Convalescent Home in the Vernon Lamb Archive. 1." Derby & Derbyshire Convalescent Home, Matlock". No publisher. Written at the Convalescent Home on 28 June 1911 and posted at Matlock on 29 June 1911. 2. "NALGO House, Matlock". A Real Photograph Postcard, No 18. Unused. Note that this image has been repaired before publication on this web site. Postcards in the collection of and provided by and © Ann Andrews. William Cartledge was christened at Crich on 26 Dec 1819. He can be found in business in Matlock in Kelly's 1855 Directory | White's 1857 Directory | the 1861 census | White's 1862 Directory (2 entries) | Kelly's 1864 Directory | Harrod's Directory, 1870 | the 1871 census. He advertised in both "Days in Derbyshire", 1863 (scroll down), complete with testimonials, and "On Foot Through the Peak", 1868. Mr. Cartledge encountered some financial problems (Names in the London Gazette, 1870) but these were resolved (Matlock Names in the London Gazette, 1871). Barton, David A. "Around Matlock in Old Photographs", (1998) part of a series called "Britain in Old Photographs", Budding Books, ISBN 1-84015-076-9. "Dante Gabriel Rossetti" (1967), The Masters, No. 89 (text by William Gaunt), Purnell & Sons Ltd.
 "Derbyshire Times", 23 October 1872. Sale at the Horse Shoe by Messrs. Bristow & Son. "The establishment has for 15 years past, and is still successfully occupied and used as a family private hotel and boarding house". "Derbyshire Times", 22 August 1874. Sale by Else & Newbold. "Derbyshire Times", 25 August 1877. Matlock Bank College. There is more about the school on Schools in Earlier Times - Former Private Schools. "The Derby Mercury", Wednesday, February 20, 1889. "The Derby Mercury", Wednesday, June 19, 1889. 1891 Kelly's Directory | 1891 Census | 1908 Kelly's Directory. She passed away in Bristol on 27 Jan 1915. Miss E. Eastland, was the sister in charge in both 1912 Kelly's Directory and 1916 Kelly's Directory. "The Derby Mercury", Wednesday, 25 July, 1900. "Derby Daily Telegraph", 31 December 1914. Derby and Derbyshire Convalescent Home, Matlock. Christmas Cheer for Patients and Belgian Refugees. "Derby Daily Telegraph", 24 April 1917. Derby and Derbyshire Convalescent Home. "Derby Daily Telegraph", 10 August 1927. "Yorkshire Post and Leeds Intelligencer", 3 February 1922. Private Treaty. Property in Matlock. Suitable for School, Home, Boarding House. Â Immediate possession. Fully Furnished and Equipped. That substantial and well-built Property, lately occupied Derby and Derbyshire Convalescent Home. Splendid situation. Trade directory references to Nalgo House Convalescent Home for Local Government Officers have been found in Kelly's 1932 Directory (Miss Pacey, Matron) and Kelly's 1941 Directory (Miss Mary L. Bridges, matron). NALGO, or the National Association of Local Government Officers, even provided Holiday Camps for the members. An interesting website, with a short history of NALGO, is Trade Union Ancestors (this will open in a new window).